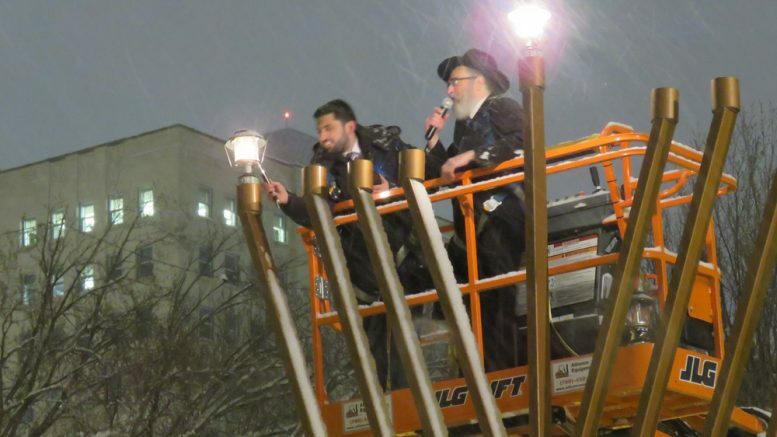 Rabbi Zolly Claman joined Chabad Rabbi Ari Drelich in lighting the giant menorah at the Legislature Grounds on the first night of Chanukah. (EJNews) – Chanukah is such a beautiful time of year. As the nights get longer and our daylight gets shorter, we kindle a flame in the inside of our homes and allow the light to emanate from inside out. We are lighting in order to remember the miracles which the Jewish people saw in our victory over the Greeks. The way we celebrate is by lighting the menorah. While one may certainly use wax candles or paraffin – the most preferred method is with olive oil. Why is that? Aside from our interest to mirror the way the kohanim, the priests, would light the menorah in the beit hamikdash, the temple, perhaps we could glean a deeper understanding why we reach to olive oil as our first choice. Chanukah is a beautiful time of year – but what is beauty? Longer nights, shorter days and colder temperatures is not what I call beautiful! In fact, historically there were two opposing world views on this topic. Full of passion and blood, the Olympic Games was the cultural highlight to the Ancient Greek calendar. For 5 days, more than 40,000 spectators would pack the stadium to watch the fights and competitions. The external perfection of the body was not only culturally significant, but seen as a religious ideal as well. On the middle day of the festival a vast number of cows were slaughtered in honour of Zeus, the king of the Greek gods. “It is hard for us to exaggerate how important the Olympics were for the Greeks,” explained Paul Christesen, Professor of Ancient Greek History. To the Greeks, beauty was the external perfection. This empire came after the Jewish people and attempted to impose this ‘beauty’ on us. But we see things in a different light. To us, beauty is internal. The more complete and pure the inside is, the more beautiful. The Torah is the rule book of the Olympics that are fought internally. Reaching out to a friend in need or giving charity responsibly may not take strong biceps and triceps, but it will necessitate integrity, honesty and patience. A Jew also dreams of the podium, but the passion is turned inwards. The victory of Chanukah represents the victory of an inner essence over external appearance. Having spent almost 10 years living in Israel, I have passed by many olive trees in my day. The olive is misleading. A raw olive looks and feels like a good for nothing dark green rock, but inside there is an ability to light a room. It is a true hidden gem. Allowing our eyes to bask in the light that emanates from olive oil awakens us to light in places we never thought it would be. That broken gas pump in -30 weather and a harsh word from a colleague before the morning coffee is an opportunity to work on that muscle called patience. The juicy piece of gossip that would feel so good to let out is a chance to train our ability to hold back. And treating our spouse and children at home with at least the same level of affection and patience as we would in public is spending time in the gym and focusing on that muscle called integrity. May the light of Chanukah shine into our lives and remind us that in every dark moment lays an internal opportunity for growth. Zolly Claman is the Rabbi at Beth Israel Synagogue – the Family Shul – a modern orthodox congregation in Edmonton. Be the first to comment on "Chanukah is a beautiful time of year"